Alexandria Borg El Arab Airport is located in the south west part of Alexandria city in Egypt. This airport is undergoing major renovations and revamping, as the passenger influx is rising. Air Arabia Egypt, Jazeera Airways, Nas Air, Turkish Airlines and Wataniya Airways are some of the airline providers serving Alexandria city. The facilities at the Alexandria Borg El Arab Airport include information help desk, with special centers to promote tourism of Egypt. The food and drink at the airport is catered by the food court located at the airport. The special services for the disabled at the Alexandria Borg El Arab Airport make it easy for them to travel through this airport. Being well connected by road to the nearby destinations, travelers at Alexandria Borg El Arab Airport go for the car hire facility to travel from the airport. Car hire is the best traveling medium sought by the travelers at the airport. Alexandria is truly a remarkable place where tourists can have one of the most pleasurable holidays. Architectures that are noteworthy include Qaitbay Fort, Ras al-Tin Palace, and Roman theatre. The beaches of Alexandria city foster even more fun and delight for the tourists. The classy and sophisticated sea facing cafes in Alexandria can make a pleasurable time spend in the city. Avid travelers need the services of a car hire to travel and see the real Alexandria city. 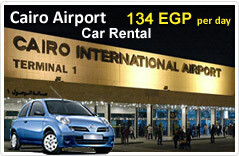 The best car hire service at the Alexandria Borg El Arab Airport is the Egypt Cars Rental. The services provided by Egypt Cars Rental include good mileage, availability of latest model cars and pre booking facility through our website. The best part of hiring a car from Egypt Cars Rental is that it offers you the most reasonable rents. In order to travel with comfort the best thing to do is hire a car from Egypt Cars Rental.